2 What we are building? In the next steps we will define two routes, one for get and another one for the post requests, and we’ll make basic form view for these routes. Before creating routes and views, let’s establish our User model. Model contains all Business Logic of your application, which means it describes how the application interacts with the database. Laravel comes with simple and elegant ActiveRecord implementation called Eloquent ORM which makes this interaction incredibly easy. By default Eloquent models are protected against mass-assignments. For this reason in $fillable property we can white list attributes we want to be mass-assignable. You can access this at http://homestead.dev/users/registration. As you can see, POST request will be send to the same URL. 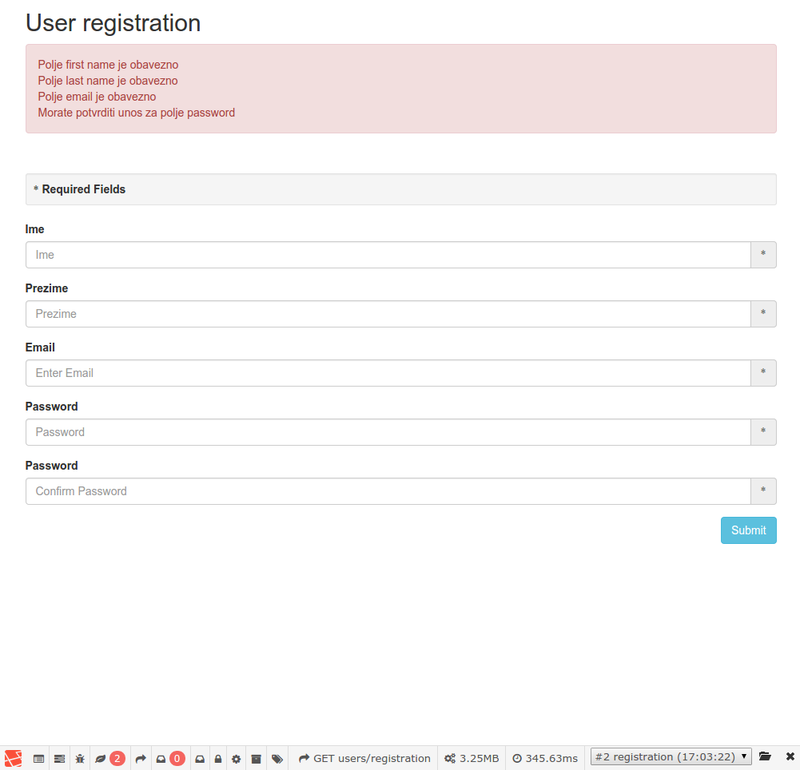 Now when the routes are set, let’s set up basic form view. After creating our model, setting up routes and basic view, we can switch our focus to the main topic of this article – validation. 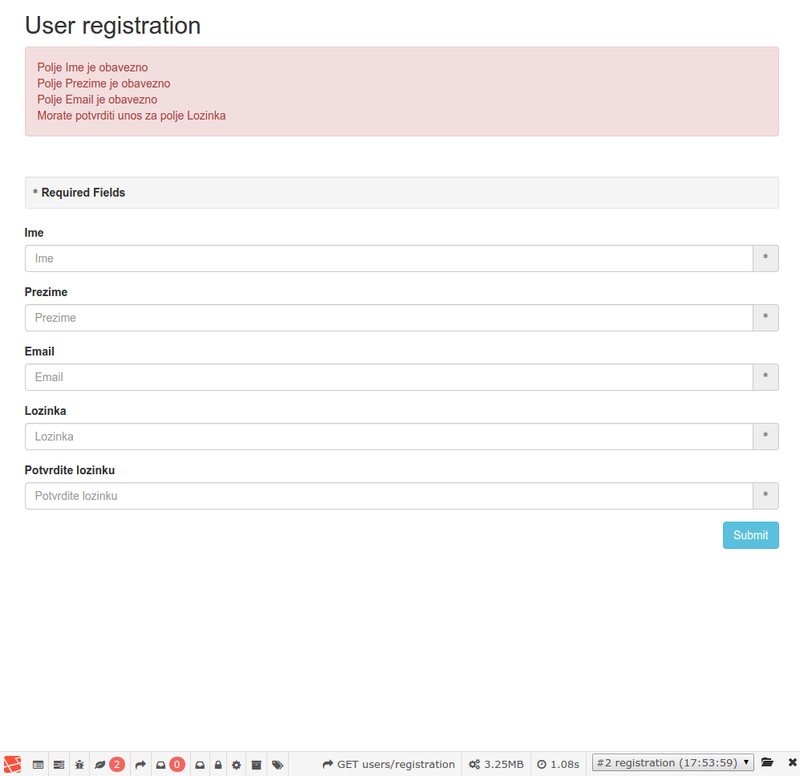 Laravel provides a great validation system, full of functionalities intended to help you validate your data. The Validator class is responsible for all of that. Simplest way to use Validator class is by calling Validator::make() method. This method has four arguments. The first argument is an array of data to validate, second is an array of rules, third argument is an array of validation messages and fourth argument is an array of custom attributes. valid() – returns the data which was valid. invalid() – returns the data which was invalid. errors() – an alternative more semantic shortcut to the message container. To see other functionalities of this class you should visit the API documentation page. NOTE: To much code inside controllers can make them difficult for testing and maintaining. You should keep your controller skinny, avoid putting everything inside it as much is possible. Follow SOLID principles. Almost every book I read about Laravel development covers this type of validation. Because it’s fairly easy to implement it’s preferable for small applications. But for larger applications I recommend putting validation logic outside the controller. The first argument we passed to the make method represent data under validation. The second argument are the validation rules we want to apply to the data. And that’s it. 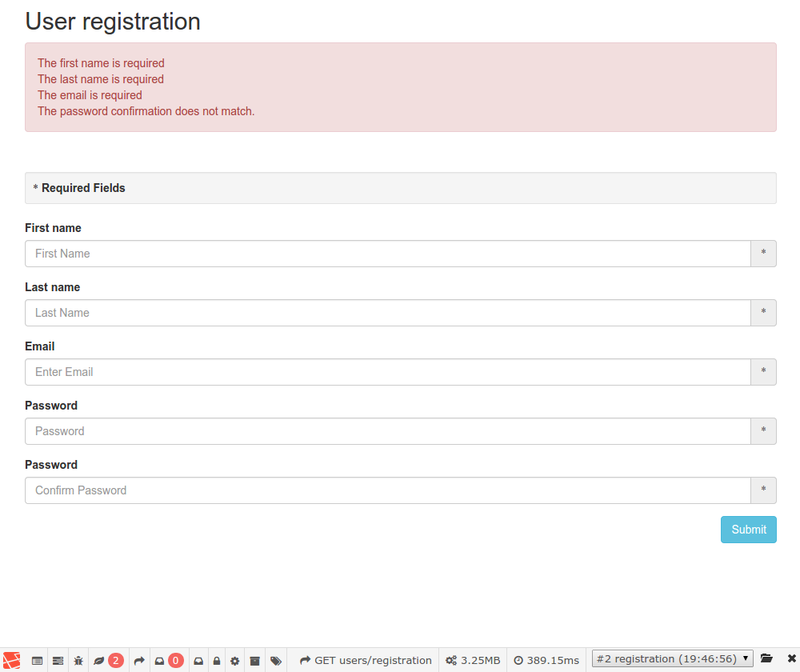 Now you know how you can perform simple validation, localize your error messages and set custom attributes. In the next article, I’ll cover model and service level data validation. If you have any comments or suggestion how to improve this article, feel free to leave a comment below.